In fact I think it’s one of the most sinister forms of misogyny around because it perpetuates a message that as a gender we are stingier, nastier and basically just not as nice as men. How can this be useful? How can this be scientific? It negates the powerful generous women who have been doing so much for other women for years. It also gives too much airtime to the women who don’t. I commend all the women supporting women right now – those of you who are mentoring, coaching, advising and helping just because you can. I am privileged to know quite a number of you. But there are also many of you I haven’t met and probably never will. You don’t do it for the credit or recognition. You do it because you’re generous and you like to help just because you can. You are to use a well-known Yiddish word a mensch. Which translated today means “a person of integrity or honour” But of course in its original German literally means a man. See how much work we still have to do? I’m not negating the hurt that we’ve all felt when we’ve been let down or unsupported by other women. But it’s crazy to make this gender specific. I’ve been hurt and let down by men too. And is it reasonable to expect unconditional support from a sisterhood just because we belong to the same gender? Men don’t do this. All they do is choose better friends. How about we do the same? The difference is that men know that politics is part of organisational life and that’s that. We need to change the narrative that happens around girls and girlfriends. Yes there might be mean girls who bring your daughter down but focus on the friends who support her too. In my work with women leaders I ask them to reflect on who they turn to in times of crisis when they refer to the PHD (pull her down) factor. The answer is invariably “my women friends”. But sometimes we neglect these friends in our busy lives – something of which I am often woefully guilty. But in the tradition of appreciative inquiry practice, what we appreciate appreciates. Our relationships need time if they are important to us. Remind your daughter to choose friends who are worthy of her and her energy. Whether they are male or female, we need to encourage affirming relationships in our lives while we limit the toxic ones. This way we’ll have more time to spend with the people who deserve us and who we deserve in return. Our #WeLead Circles are rich opportunities to experience female generosity and advocacy so please do drop me a line if you’d like to experience what it’s like to be surrounded by a dream team of powerful women who hold you accountable for achieving your goals. Is there still place for a women’s leadership conference? Yes I’m still asked this question, even though leadership conferences with all-male line-ups continue to be trotted out with alarming regularity. So I’m taking the liberty of publishing extracts of this general press statement as a blog post on the eve of the 8th Annual Women’s Leadership Conference. At a time when many women hold top leadership positions, some might question the value of women’s leadership conferences. However, Debby Edelstein, founder, organiser and chairperson of the 8th annual Women’s Leadership Conference, says in a world where men still dominate the conference circuit, women leadership conferences are essential for mentorship and encouragement, giving women a platform to share their knowledge and experiences. “There is an inordinate amount of conferences where it’s still regarded as acceptable to exclude women’s voices from the debate. Much of the context that we work within remains patriarchal and unwelcoming to women’s voices,” says Edelstein, referring specifically to a number of high profile conferences last year which boasted a conspicuous absence of women in their line-ups. The Women’s Leadership Conference, which takes place on 22 May and 23 May 2013 at the Hyatt Regency Hotel in Rosebank, provides such an opportunity, however, with one strategic difference: In addition to a strong line-up of highly successful women leaders, this year includes a few top male speakers (namely GIBS dean, Professor Nick Binedell; journalist, Victor Dlamini; CEO of Avatar Zibusiso Mkhwanazi and co-founder of the Citizens Movement, Bobby Godsell). This is the first time men have been included in the Women’s Leadership Conference, a decision which was made following a survey of the women who took part in last year’s conference. 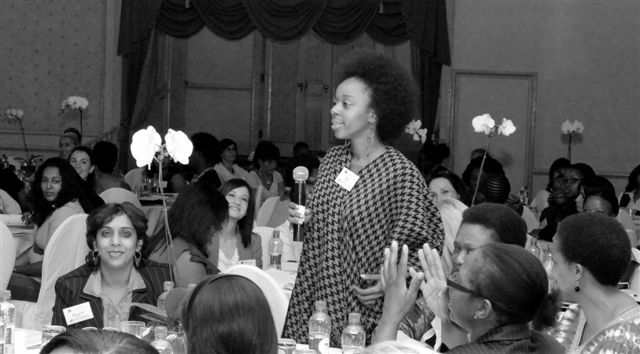 “Although women still dominate the event, placing women speakers and men speakers together on the same line-up entrenches the message that there is an abundant talent of top women speakers who are capable of sharing the podium with their male colleagues, women who are equally poised to speak about leadership issues. “Importantly, the inclusion of men also helps to ensure the women’s leadership agenda becomes a conversation that men are having too,” she says. “We want to encourage women to recognise their leadership abilities, to see themselves as leaders and raise the game in terms of the topics they speak about. The Women’s Leadership Conference creates this space,” concludes Edelstein.